Pallets are used in a variety of automated and semi-automated parking systems. 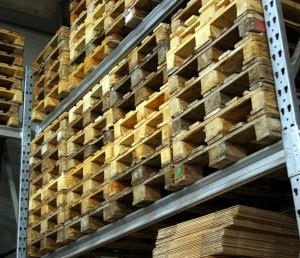 Like a car-sized plate, the pros and cons of pallets have been debated for decades. The current trend toward pallet-less systems may be a bad idea if the alternatives create more problems. We’ll explain as we look at some of the pros and cons of pallets. First off, we should make clear that a car-parking pallet is a flat, movable structure for a car to sit upon as it is transported and parked within some type of parking system. The car remains on the pallet until it leaves the car system. Since cars aren’t designed to be moved without a driver or lifted, the car parking pallet simplifies the transport of a car within a parking system. The car’s tires rest on the pallet and all mechanical transport apparatus interface with the pallet. This minimizes the complexity of transport mechanisms since no accommodations for car size (wheelbase, width, ground clearance, etc.) are required. It also means that no equipment such as robotic or other lifting mechanisms touch the car. Moreover, car-parking pallets may provide some maintenance and environmental benefits. Parked cars drip, leak and drop all types of liquids and solids from rainwater, snow, coolants and lubricants to road dirt, sand, salt and debris. Capturing these materials on the pallet can reduce clean up within the parking system. If the materials collected on the pallets are disposed of properly, then the parking system prevents them from entering the environment. One downside of car-parking pallets is the logistics: moving and storing empty pallets. For example, when two cars sequentially enter a parking system, an empty pallet must be located and moved into place to pick up the second car for parking. What do you do with empty pallets when they aren’t in use? Regardless the answer, there is very likely some loss of efficiency due to the movement and storage of empty pallets. Furthermore, pallets are typically sized to accommodate the largest possible vehicle since the logistical challenge of using two sizes of pallets is considerable. This leads to all parking spaces being the same size as the pallet. Parking subcompact cars in spaces designed for full-size cars isn’t as space efficient as having parking spaces for different car sizes. Car-parking pallets are not weightless. This means an increase in the energy used to transport cars. The arguments for and against car-parking pallets are complex since they are integral to such important factors as speed, space and energy efficiency, maintenance and reliability. Intuitively, eliminating pallets seems advantageous. However, slow, delicate and high-maintenance robotic transport systems may be less capable and less reliable than using pallets. The bottom line is that automated parking systems transport designs, with or without pallets, should be thoroughly evaluated.